“Pho, pho, pho! Ninety-nine percent of Vietnamese restaurants have the same menu,” carps Eric Banh, owner, with his sister Sophie, of the popular Monsoon restaurants in Seattle and Bellevue. Where, by the way, they make a mean bowl of pho. While Sophie impresses by working magic running Monsoon — overseeing the dual kitchens and executing their contemporary Northwest take on the Vietnamese foods they grew up eating — her younger brother is the dude with the entrepreneurial eye for expansion. Having birthed a pair of splendiferous-sandwich shops called Baguette Box, this month he’s unveiled another venture, Ba Bar. The 55-seat cafe and bar anchors a handsomely restored building near the confluence of 12th and Cherry. Its soaring windows face Seattle University’s baseball field. Miss the address, and a bold neon sign with a down-facing arrow points you in the right direction. Last week, I stopped in for a nightcap and noodles, later catching up with Eric by phone. 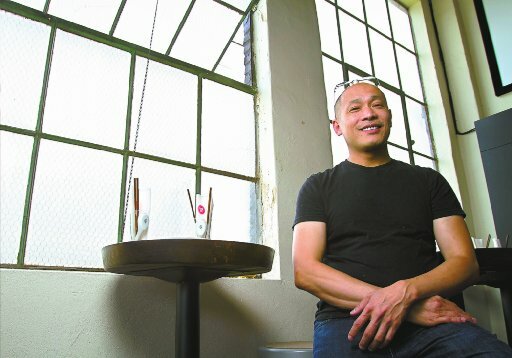 He had plenty to say about Vietnamese food culture in Seattle — and elsewhere. Eric Banh, at Ba Bar, open daily from early till late at 550 12th Avenue. Q: Your family left Saigon when you were 12 after the city fell to the communists. What food memories did you take with you? A: My dad is Chinese. He came to Vietnam in 1952 and passed away two years ago. I named the place for him: Ba means “father.” I remember how he’d take me to Cholon, the Chinatown of Saigon. Nobody spoke Vietnamese. Roast ducks and chickens hung everywhere, chopped on the spot. That’s why we have a rotisserie in our kitchen and a daily “roti” — barbecue pork, chicken, duck or even half a goat leg — on the Ba Bar menu. My dad had an ice-production factory in Vietnam. I remember big blocks of ice that would rarely melt. Street vendors would buy them, and so would poor families who didn’t have a refrigerator. You’d go to the corner store for coffee, soda and ice. And I remember root beer in Vietnam tasted so good, because it was made with cane sugar. Q: You insist, “I would never want anyone to call Ba Bar a restaurant.” Who ya foolin’? Sure you’ve got a slick bar offering classics, including a Moscow Mule and a Mai Tai, and an equal number of creative concoctions (like the gin-fueled mint- and lime-stoked “Marymorter” that’s a swell match for your menu’s Asian flavors). But you’ll excuse me for saying: If it walks like a roti duck and quacks like a roti duck, it’s a restaurant. A: In Vietnam we have a word, quán, which means a casual place, a cafe. That’s what this is. Its spirit is street food. Q: Street food? If that’s what you wanted to do, why didn’t you just put a cafe on wheels, like everybody else is doing these days? A: A lot of North Americans have the notion that street food means poor or cheap, but in Vietnam, street-food vendors are people with more passion, pride and prowess than I’ve ever seen. They execute two or three items — recipes often passed down by second or third generations of cooks — and they do it expertly. Q: OK, your idea was to host a venue open daily: morning, noon and night. A place where we might sip espresso and eat fresh pastries, watch kung fu movies and snack on Hue dumplings or pate chaud. And after sampling Ba Bar’s rich noodle soup with Muscovy duck-leg confit ($10) and noting your menu highlights roasted chicken alongside claypot specialties ($12) and a vermicelli combo ($12), I can’t help but liken Ba Bar to your pal Jim Drohman’s popular French-accented hangout Cafe Presse. A: You’re absolutely right. [As at Presse] I want this to be a place where you can spend $5 [on housemade pate chaud, or a Three Skulls beer] or $50 [on grass-fed steak frites for two, with wine]. I’m happy to be here in the neighborhood, close to the Vietnamese district and Cafe Presse, and I think the neighborhood will support Ba Bar, understand it and embrace it.